A brilliant nurse in my crisis team has recently been on a Compassion-Focussed Therapy training course and met with me the other day brimming with ideas. Self-compassion is something that feels entirely intangible and unachievable for me, so we’ve got our work cut out, but thankfully she’s willing to give it all a go with me regardless! I’ll share some of the different exercises as I embark upon them… first up is creating a ‘Compassionate other’. As drawing things helps me, we decided that maybe the best place to start was drawing this potential compassionate other to give me a visual prompt. Humans don’t feel at all safe to me, so I knew straight away mine wouldn’t be in the form of a human, and very quickly my mind jumped to mythical creatures and, more specifically, dragons. 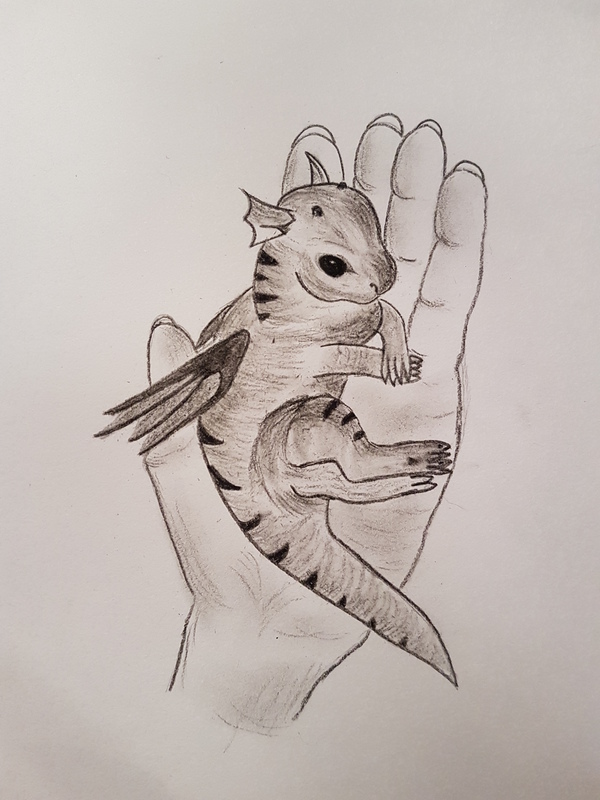 I thought of this dragon as being both gentle and strong, comforting and protective, and something that I could carry with me wherever I go…thus, the ‘Palm Dragon’ was born! I think he’s rather sweet, but you can tell in his eyes that he can stick up for himself and for what he believes in, too. Now I just need to narrow down and foster his compassionate traits, and see if I can somehow implement him into coping mechanisms to counteract the never-ending, overwhelming negative self-talk and intense self-hatred. I’m hoping this concept can also be fostered into something protective or safe-feeling that can be carried with me for other uses: my idea of a Muggle’s Patronus (for anyone who isn’t a Harry Potter fan, a Patronus is a “guardian or protector, which takes the form of an animal…one of the most powerful defensive charms…a pure, protective magical concentration of happiness and hope”. I’ll fill you in when I get further along creating and cultivating my compassionate Palm Dragon. I’d love to hear of any of you have already or will now try to create one for yourselves, too!